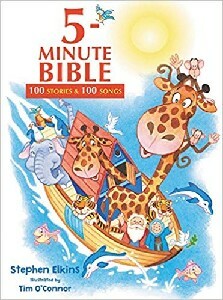 ~Curl up with your little one, and discover 100 of the greatest Bible stories. From Mosesâ€™ encounter with the burning bush and Jonahâ€™s trip to Nineveh to Jesusâ€™ parable of the prodigal son and the last supper, 5 Minute Bible: 100 Stories and Songs will make an eternal difference by revealing Godâ€™s amazing love. With biblical truths and life-action applications, your child will take these biblical teachings to heart, and the adorable illustrations and song lyrics will help make these five minutes the best part of the day. Set aside five minutes to discover the Bible with your childâ€”and start today!